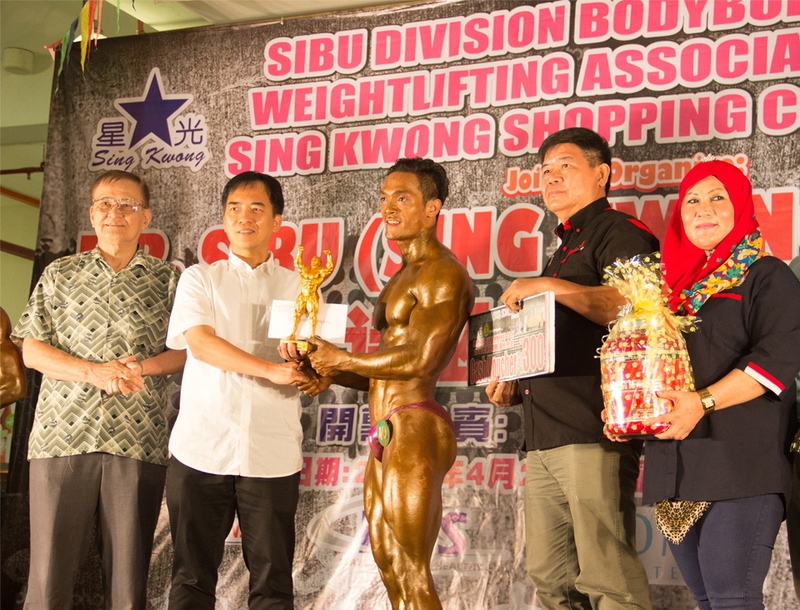 Charles Luanga Uyong (centre) receives a trophy from Sibu Division Resident Hii Chang Kee (2nd left), witnessed by Sing Kwong Group chairman Tang Tai Teck (left), SDBWA president Chia Soon Cheong (2nd right) and Miri Division Bodybuilding Association president Jamilah Ibrahim (right). SIBU: Charles Luanga Uyong was crowned as ‘Champion of Champions’ of the Mr Sibu 2017 (Sing Kwong) Bodybuilding Championships held at Sing Kwong Shopping Complex, here last Saturday. The Sports Science teacher, who based in Kuala Lumpur won the Above-70.1kg category after defeated Farrokh Ibtisam Ting Abdullah, Tie Siew Kean, Tiong Cheong Soon and Edric Jiau Yew Ang who were in the first, second, third and fourth runner-up places respectively. “This is a great feeling – to compete in my hometown for the first time and claim this win. As I’m presently based in Kuala Lumpur due to my job, I have been competing elsewhere (outside Sibu) for the past several years and winning some other titles, but to achieve this in Sibu is just tremendous,” said Charles after the event. “I’m looking forward to the upcoming Mr Sarawak 2017 championships in Miri,” added the 30-year-old who started to train since 2010. Meanwhile, Roger Wong Hing Ming grabbed two titles during the championship by beating Nicholas Ting and Michael Raphael in the Novice and Under-65kg category respectively. In 65.1kg—70kg category, the title went to Anthony Tebie Raphael, who beat Mohamad Khairul Semion (first runner-up), Alfie Khan Abdul Aziz Khan (second runner-up), Roger Ting Wei Ming (third runner-up) and Romanus Alasa (fourth runner-up). The ‘Champion of Champions’ showdown was between the three categories winners with Charles has finally won the title for the first time in his own hometown. 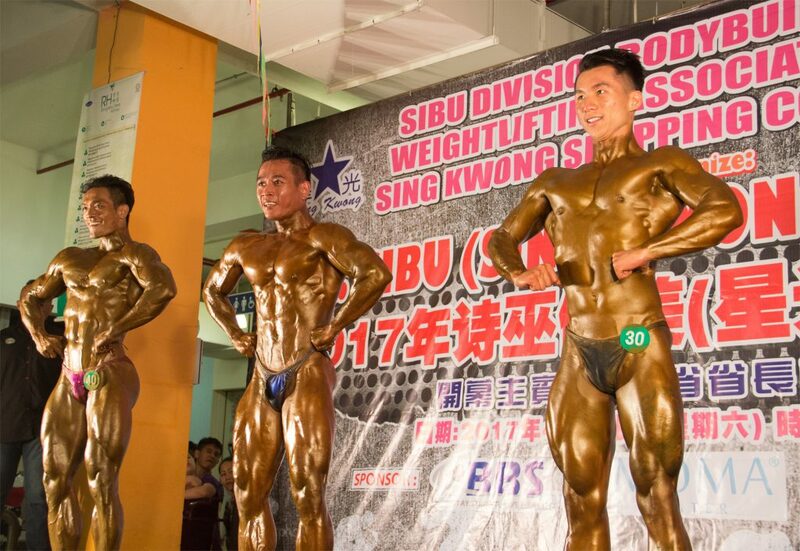 Organised by Sibu Division Bodybuilding and Weightlifting Association (SDBWA), this year’s championship finals was graced by Sibu Division Resident Hii Chang Kee. The event was sponsored by Sing Kwong Shopping Complex, BBS Supplements, RH Been Farms, MOMA Water and OLIMP Sports Asia. Also present at the event were President of Sibu Division Bodybuilding and Weightlifting Association (SDBWA) who is also the organising chairman of Mr Sibu 2017 Chia Soon Cheong, Deputy President of SDBWA Ling Tung Hock, Thomas Lee who is the head of judges comprising Florence Kho, Madeline Chan and Ling Teck Kiong. (From right) Category winners Roger Wong Hing Ming, Anthony Tebie Raphael and Charles Luanga Uyong pose for the crowd during the ‘Champion of Champions’ showdown. Charles is Mr Sibu 2017 0 out of 5 based on 0 ratings. 0 user reviews.